Tightening the belt on plum guts. For some reason, the woman who cuts my hair, Gail, offered me her entire Santa Rosa plum harvest this year. Not only did she offer it to me, she and her husband picked and bagged every last fruit on their tree last week and told me to come and get ’em. In five paper bags, the fruit weighed in at about 40-50 pounds. Daunted by Sarah’s recent jam-making marathon and upcoming vacations, we both eyed the bags on the kitchen floor and wondered who would make the first move. I did. When Sarah lived in Aptos, one of her housemates, sculptor Richard Smith, left a bottle of plum wine on the dining table, and invited us to sample it. I did. It was delicious. 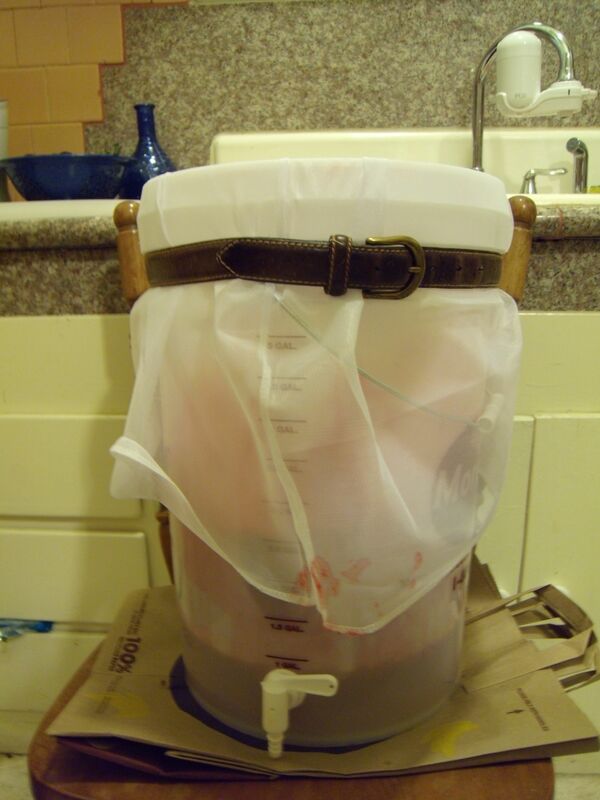 Inspired by recent visits to a creative gastropub and the memory of Richard’s wine, I decided to make my first ever batch of homemade plum wine. After doing some research online and becoming overwhelmed, I began an email correspondence with Richard, who has very graciously shared his process, tips, and equipment list. Whenever Sarah and I are about to attempt something new in the garden, especially things with which we have no experience, we always think of Richard and Tanya (his mate and companion). At one end of the spectrum, they represent the least fancy, yet most practical — and usually successful — approach to things, whether it be beekeeping or chicken-rearing. So, armed with a 5-gallon food-grade plastic bucket and something more fancy than pantyhose (Richard’s method) that I bought at my local homebrew shop, I began juicing my plums last night, squeezing each plum into the net-like bag hung down into the bucket and belted in place, whooshing the mixture around by hand to force the juice out, and finally calling upon Sarah to hold a too-large bag of plum guts while I “milked” what juice and pulp fines (not a technical term) I could. It felt like an udder. The pulp fines were velvety. Richard commented on how sensual the experience is, and I agree. Subsequent batches were smaller for manageability. This morning, I continued juicing, or milking, as it were. 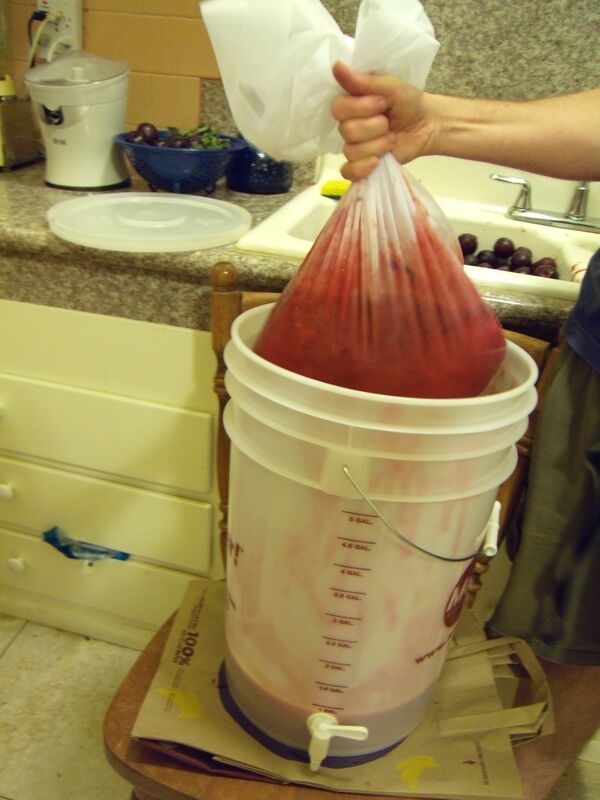 This time, however, I juiced in smaller batches so that I could handle the guts without help and milk them myself. I ended up with four-gallons of juice, which will go into the freezer as soon as some beeswax and capped honeycomb is removed. We’ve had a bit of a wax moth invasion and are freezing everything-wax that we’ve been storing in our house. When I return from vacation, I’ll thaw the plum juice, add the Campden tablets and get down to the business of making wine — the Richard way. Should be easier than what I’ve read online, and with any luck, will turn out equally delicious. Luma, caught in mid-cluck just after consuming a special post-laying snack of sunflower seeds. 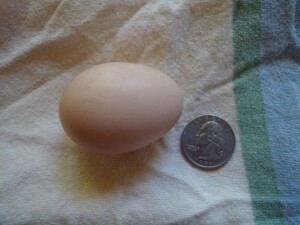 20 weeks to the day after bringing our Barred Rock chick, Luma, home, she laid her first egg this morning. She’s proved once and for all that she is the baby sister no longer, beating out our slightly older Barred Leghorn and claiming the title of “First Laying Hen”. 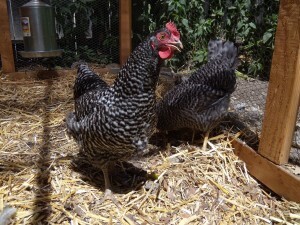 We suspected something was up when, last night, we discovered that the girls had removed the straw from their coop. This morning, while I was at the nursery picking up replacement pickling cucumbers (most of mine mysteriously died after planting out), Kelly called to report that Luma had disappeared into the coop and was again moving straw around. 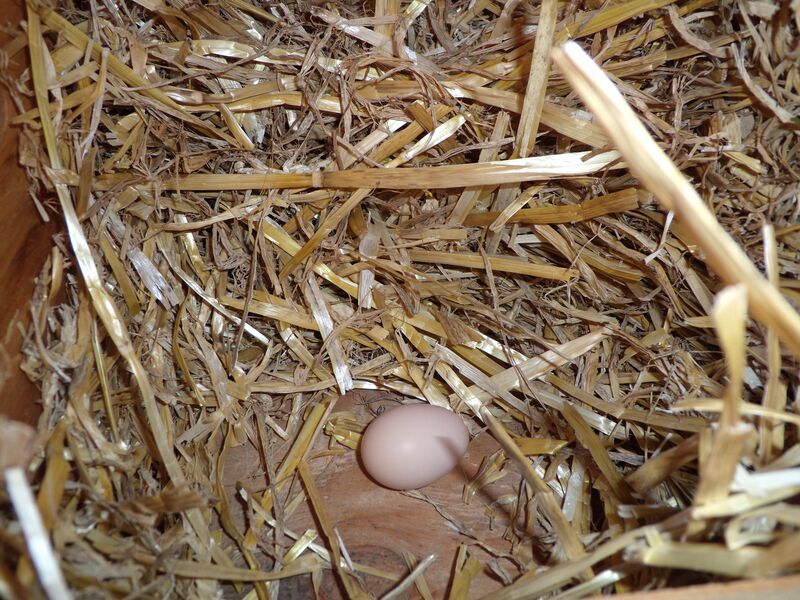 Upon my return, I peeked into the nest boxes and discovered the most adorable little brown egg. 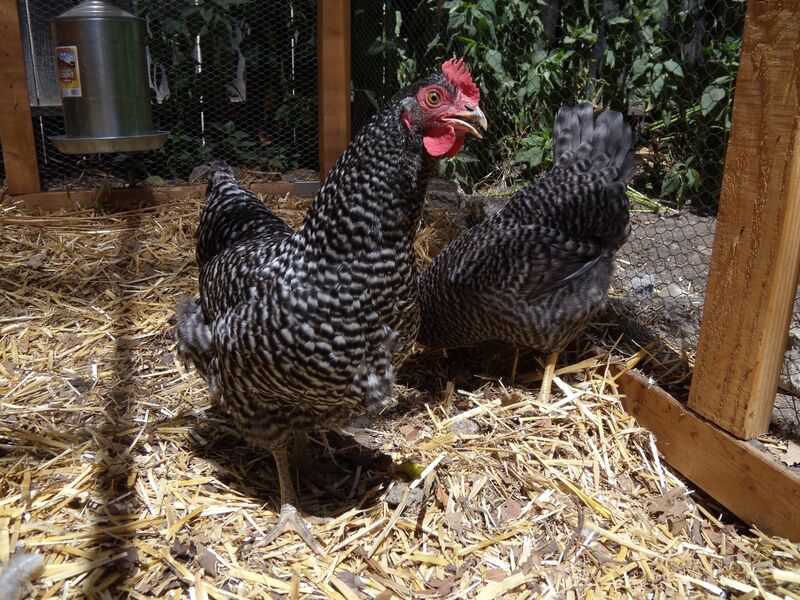 Seems the Barred Leghorn, Petunia, may be quick to follow Luma’s example. 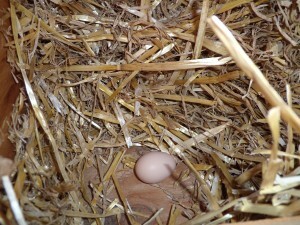 This afternoon she too went into the coop and scratched through the straw for some time. This is a behavior we’ve never witnessed in them before. They appear to be taking the prospect of motherhood quite seriously and are going to great lengths to prepare appropriate nesting sites. Smaller than a bread basket. I was particularly impressed that Luma deposited her first egg in a nest box, since I’ve heard stories of clueless young hens that don’t realize what’s happening and lay on the go. 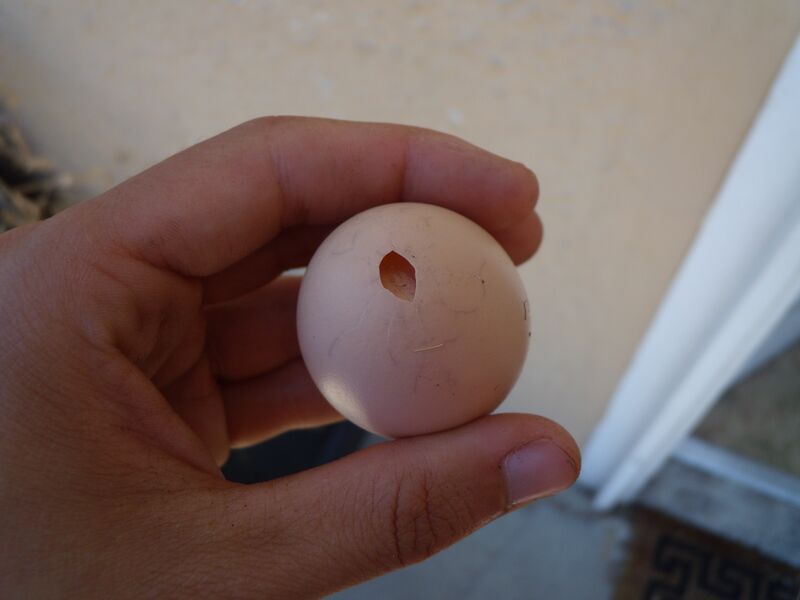 My only concern at this point is a large peck on top of the little egg, suggesting that Luma considered eating the egg before she thought better. Let’s hope she doesn’t make a habit of it. Perhaps it took Luma a moment to realize that she was pecking at potential offspring. Or am I hopelessly anthropomorphizing?